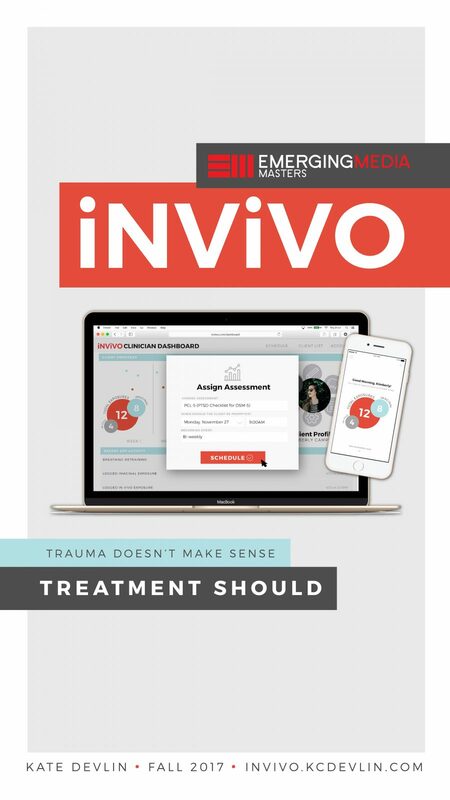 iNViVO is a mobile application and web platform designed to serve as a digital companion for prolonged exposure (PE) therapy, one of the fastest growing treatments for PTSD — an anxiety disorder that affects nearly 7.7 million adults every year in the United States. When paired with weekly in-person sessions, iNViVO creates an immersive digital experience that helps clinicians better facilitate treatment, increase their client retention rates, and most importantly, provide those silently suffering with the help they so desperately need. iNViVO’s main features allow users clinicians and their clients to customize their treatment program, visualize their progress, safely store their recorded exposures, access all tools and resources necessary to completing the treatment program, and securely communicate between weekly sessions.